Lent began this week - 40 days before Easter which Christians use for the soul's spring training. It is a perfect time to ask "What on earth am I here for?" 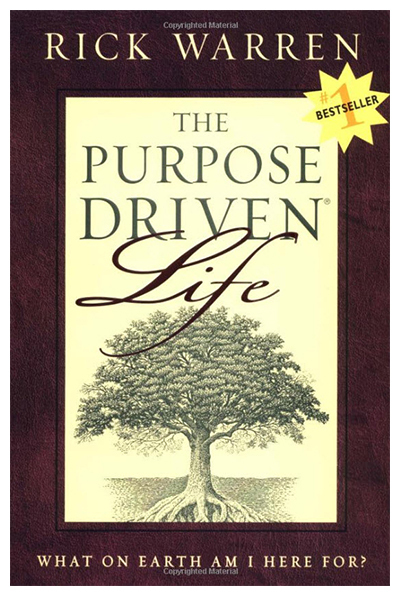 writes Rick Warren in his book, The Purpose Driven Life, which 33 million people have bought. Moses was transformed by 40 days on Mount Sinai. Jesus was empowered by 40 days in the wilderness and his disciples were transformed by 40 days with Jesus after the Resurrection. His powerful book is written in 40 brief chapters, to be read one each day. The Bible says, "Let God transform you into a new person by changing the way you think. Then you will know what God wants you to do" (Romans 12:2). Warren, is founder and pastor of Saddleback Church in California attended by 20,000 people weekly. He quotes Proverbs 11:28: "A life devoted to things is a dead life, a stump; a God-shaped life is a flourishing tree." I urge you to buy the book, and underline key passages. It is natural to begin with ourselves: What do I want to be? However, Warren writes, "You didn't create yourself, so there is no way you can tell yourself what you were created for...You must begin with God, your Creator. You exist only because God wills that you exist. You were made by God and for God - and until you understand that, life will never make sense." God determined your natural talents and your unique personality. Warren writes, "While there are illegitimate parents, there are no illegitimate children." They may have been unplanned by their parents, but not by God. There are many "self-help" books. They suggest that you "Consider your dreams. Set some goals. Aim high. Believe you can achieve your goals." However, Warren warns, "Being successful and fulfilling your life's purpose are not at all the same thing." Rather, he suggests becoming what God created you to be. How do you discover God's purpose? One option is to speculate. That's what most people do. However, God "has clearly revealed his five purposes for our lives" in the Bible, which Warren calls our Owner's Manual." The first purpose of God is to worship him. C.S. Lewis wrote, "In commanding us to glorify him, God is inviting us to enjoy him." Warren asserts God wants our worship "to be motivated by love, thanksgiving and delight, not duty." We tend to think of worship as praising, singing and praying to God. But Warren writes, "Worship is a lifestyle of enjoying God, loving him, and giving ourselves to be used for his purposes." The second great purpose to recognize that "We bring God glory by loving other believers." When you were born again, you became a member of God's family. It is not enough to believe in God. We must also learn to love the family of God. Jesus said, "As I have loved you, so you must love one another. By this all men will know that you are my disciples, if you love one another" John 13:34. Warren asserts our third great purpose is "to grow to spiritual maturity...becoming like Jesus in the way we think, feel, and act." Our fourth great goal is to serve others. Each of us has "talents, gifts, skills and abilities" that are not to be used for selfish purposes, but to benefit others. Warren notes that "Thousands of books have been written on leadership, but few on servanthood...God shaped you for service, not self-centeredness." John Wesley's motto was: "Do all the good you can, by all the means you can, in all the ways you can, in all of the places you can, at all the times you can, to all the people, as long as you ever can." At Saddleback Church a group of CEOs and business owners are trying to make as much as possible so they can give much more to further the kingdom of God. Our fifth great purpose is to tell others about him. "God doesn't want his love and purposes kept a secret. Once we know the truth, he expects us to share it with others," Warren writes. Living the rest of your life for God will require changes of priorities, schedule, relationships - and often a difficult path. Even Jesus struggled with this. Knowing he was about to be crucified, he cried out, "My soul has become troubled; and what shall I say. `Father, save me from this hour'? But for this purpose I came to this hour. Father, glorify Thy name." This Lent grow closer to God by reading this book.